FoodBasics101: Starting A Charcoal Grill- For Newbies! I must admit I've always been a little skittish about starting a charcoal grill...all that smoke and fire. The manly men in my family are the ones who do the outdoor grilling. That's why I was happy to find the Weber's Girls' Guide To Grilling (a free e-booklet, link is below). 1. Safety first! Barbecue mitts should be worn while cooking, adjusting air vents, adding charcoal, and handling the thermometer or lid. Use long-handled barbecue tools with heat-resistant handles. 2. Remove the lid and open the air vents. If there are accumulated ashes in the bottom of grill remove them to help with proper airflow. Check to see that all vents are clear and not clogged. 3. Mound the briquets into a pyramid-shape in the bottom of the grill. 4. Place a bit of crumpled newspaper or lighter cubes underneath the briquets. 5. Using a long-handled lighter or match, light the newspaper or lighter cubes.The briquets will heat up. 6. When the briquets are covered with a light grey ash (takes about 25 to 30 minutes) use long-handled tongs to arrange the briquets according to the cooking method you will be using. 7. If you prefer additional smoke flavor add hardwood chips or chunks (soaked in water for 30 minutes). Oak, maple, cherry, and hickory woods are good choices. Place the wet chips or chunks directly on the coals just before cooking. 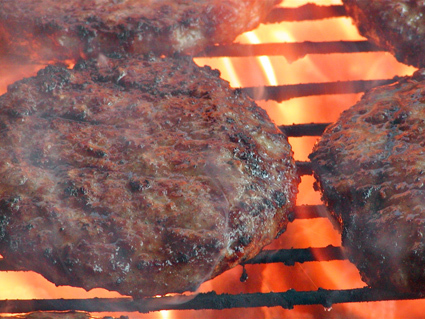 Check out Weber's Girls' Guide To Grilling. It's a free e-booklet download by Weber with lots more info, grilling recipes, tips and techniques.